Acceptance of any order or contract by K-mac Plastics acknowledgement or commencement of performance is expressly conditional on purchaser's assent to the terms and conditions below even though no reference may be made thereto at time of acceptance. K-mac Plastics expressly objects to any additional or different terms than those set forth herein. Unless otherwise modified in writing, the terms and conditions below apply and supersede all prior or contemporaneous representations, discussions, correspondence or agreements between the parties. K-mac has a $50.00 minimum order, all orders under $50.00 are subject to a $20.00 small order fee. All International Orders must ship on a customers UPS, DHL or Fedex Account Number. This can be emailed, faxed or called in to K-mac Customer Service at 616-406-0671 or 616-406-0682 faxmile. All International Orders will be charged $40.00 for creation of a Custom's Invoice and Certificate of origin, required by US Customs. Shipping dates are approximate and are based on prompt receipt of all necessary information and approvals from the purchaser. K-mac Plastics shall not be liable for failure to perform or for delay in performance due to fire, flood, strike, or other labor difficulty, acts of God, act of any governmental authority or of the purchaser, riot, embargo, car shortage, wrecks or delay in transportation, inability to obtain necessary labor, materials or manufacturing facilities from usual sources or due to any other cause beyond its reasonable control. In the event of delay in performance due to any such cause, the date of delivery or time of completion will be postponed by such length of time as may be reasonably necessary to compensate for the delay. Terms of payment are net within thirty (30) days (to approved credit) from date of invoice. (We do not extend terms to International Accounts) House accounts are opened with orders exceeding $1,000.00. We accept all Major Credit Cards. If payments are not made in accordance with these terms, without prejudice to any rights of K-mac Plastics including the right to immediate payment, a service charge will be added to the account of purchaser in an amount equal to the lesser of 1-1/2%: per month or fraction thereof or the highest rate permitted by law on the unpaid balance. To obtain credit you must provide the following current credit information: 1) one bank reference including account number, branch and telephone number, 2) three current trade references including addresses and telephone numbers. In the event of credit refusal, orders will require (at the discretion of K-mac Plastics) payment in advance or cash on delivery, or via credit card transaction. If, in the judgment of K-mac Plastics, the financial condition of the purchaser at any time during the manufacturing period or at the time the product is ready for shipment, does not justify the terms of payment specified (other than payment in advance), K-mac Plastics may require full or partial payment in advance. If shipments are delayed by the purchaser, payments shall become due from date when K-mac Plastics is prepared to make shipment. If manufacture is delayed by the purchaser, payment shall be made based on the contract price and percent of completion and purchaser shall reimburse K-mac Plastics for any additional costs resulting from such delay. Products held for the purchaser shall be at the risk and expense of the purchaser. The prices do not include any Federal, state or local property, license, privilege, sale, use, excise, gross receipts or other like taxes which may now or hereafter by applicable to, measured by or imposed upon or with respect to the transaction, the property, its sale, its value or its use, or any services performed in connection therewith. Purchaser agrees to pay or reimburse any such taxes K-mac Plastics is required to pay. No returns will be accepted by K-mac Plastics without proper authorization. Authorization and shipping instructions for the return of any product must by obtained in writing from K-mac Plastics All returns are subject to a 20% restocking charge or $35.00/Line Item, whichever is greater. Product must be returned with complete identification in accordance with K-mac Plastics instructions or it will not be accepted. 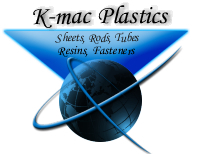 Products must be in marketable condition upon receipt by K-mac Plastics Purchaser will be charged for any outgoing and incoming transportation paid by K-mac Plastics Custom made-to-order items and non-standard items are non-returnable. In no event will K-mac Plastics be responsible for product returned without proper authorization. No returns will be accepted after 30 days from the shipment date. Any order may be canceled only on written notice. Cancellation charges will be charged to purchaser at the time of cancellation for all expenses incurred by K-mac Plastics. Orders that are shipped and are cancelled in transit, the customer will be responsible for all shipping charges, including the return of the product. K-mac Plastics, its subcontractors and suppliers of any tier, shall not be liable in contract, in tort (including negligence or strict liability) or otherwise for damage or loss of other property or equipment, loss of profits or revenue, loss of use of equipment, cost of capital, cost of temporary equipment (including additional expenses incurred in using existing facilities), claims of customers of the purchaser, or for any special, indirect, incidental, or consequential damages whatsoever. The remedies of purchaser and the liability of K-mac Plastics shall not exceed the price of the product or part on which such liability is based.